MANILA -- President Rodrigo Duterte is set to embark on a working visit to Japan on Oct. 29-31 "to further enhance the strong bilateral relations between the Philippines and Japan", the Department of Foreign Affairs (DFA) said. 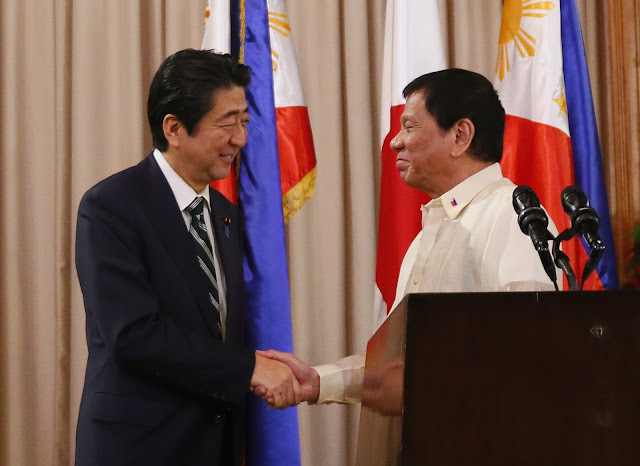 In a statement sent to reporters Wednesday, the DFA said Duterte would meet with Japanese Prime Minister Shinzo Abe to discuss matters of mutual interest to both countries. He is also scheduled to meet with other high-ranking Japanese government officials and influential captains of industry. “Aside from bilateral issues in the economic, industrial, social and security arena, discussions are also expected to include regional developments, including peace and stability in the region, particularly in the Korean Peninsula,” the statement said. “Both sides are also expected to engage in dialogue relative to the Philippine chairmanship of ASEAN and preparations for the Prime Minister’s own return visit to the Philippines for the 31st ASEAN Summit and Related Meetings in Manila this November,” the DFA added. The Philippines and Japan have extensive bilateral interactions since Duterte assumed office in June 2016. Duterte’s upcoming visit would be his second trip to Japan and his third meeting with Abe. The President first visited Japan on Oct. 25-27 last year. Last January, Abe visited the Philippines and became the first foreign head of government to be hosted by Duterte in Malacañang. The Japanese leader also went to Duterte’s home in Davao City. In the meantime, Abe’s return visit to the Philippines in November would likely see the signing of loan commitments for three big-ticket projects of the Duterte Administration. These are the PHP230-billion Mega Manila Subway Project-Phase 1; the PHP211.5-billion Malolos-Clark Airport-Clark Rail Project: and the PHP9.99-billion Cavite Industrial Area Flood Management Project. Libelous Blogger Cocoy Dayao hiding in the US?